The Pashtun tribes, or Afghan tribes (Pashto: پښتانه ټبرونه يا پښتانه قبايل‎), are the tribes of the Pashtun people, a large Eastern Iranian ethnic group who use the Pashto language and follow Pashtunwali code of conduct. They are found primarily in Afghanistan and Pakistan and form the world's largest tribal society, comprising over 49 million people and between 350 and 400 tribes and clans. They are traditionally divided into four tribal confederacies: the Sarbani (سړبني), the Bettani (بېټني), the Gharghashti (غرغښتي) and the Karlani (کرلاڼي). There are several levels of organisation of Pashtun tribes. The "tribe" is subdivided into kinship groups, each of which is a khel and zai. A khel or Zai is further divided into "Plarina", each of which consists of several extended families. A large tribe often has dozens of subtribes whose members may see themselves as belonging to each, some or all of the sub-tribes in their family tree depending upon the social situation: co-operative, competitive or confrontational. Tarbur refers to a "tribe" split into two or more clans and Tarbur mean cousin in Pashto so Tarbur could be enemy as well in the Pashtun culture that they can occupy your land or property. Every Pashtun tribe is then divide into subtribes, also called khel or zai. Zai in Pashto means "descendant". In Avestan it is similar to Pashto "Zoi" meaning son or offspring. William Crooke has said that khel is from an Arabic word meaning "association" or "company". A khel is often based in a single village, but it may also be based on a larger area including several villages, or part of a town. Plarina is related to the Bactrian term plār, which derives from Old Iranian piðar (in Bactrian and Pashto, Old Iranian /ð/ usually yields /l/), and is related to Sanskrit pitar and English "father". The plural form of plār is plārina. A plārina is considered only when the 7th generation is born, meaning the father of multiple families (kahol). Usually, the 7th forefather is assumed to take from one-and-a-half century to two centuries. Kul (plural kahol) is the smallest unit in Pashtun tribal system, named after an ancestor of 1. Zāmon ("children"), 2. Lmasay / Nwasay ("grandchildren"), 3. Kaṛwasay ("great-grandchildren"), and 4. Kaoday ("great-great-grandchildren"). Once the fourth generation is born, it would be labelled a "family" or kūl. The Bettani speak various Pashto dialects. The Ghilji or (Gharzai) of the central region around Paktika speak Central Pashto, a dialect with unique phonetic features, transitional between the southern and the northern dialects of Pashto. The Lohani (Rohani, Nohani) Marwat, as well as some other minor Lodi tribes and the Bettani proper, speak the Marwat Lodi Bettani dialect, which is a southern Pashto variety, however, its phonetics are different from the southern Kandahari Pashto. The Sheerani tribe of the Bettani confederacy speaks another southern dialect. The northern Bettani clans speak the northern or "hard" Pashto variety. Some of the Bettani lineages, including some (but not all) clans of the Tanoli, Niazi, and Swati tribes, have abandoned Pashto. Today they speak other languages, like Urdu, Hindko, Saraiki, Punjabi, Dari. The Gharghashti Kakar Naghar Panni Mandokhel and Musakhel and other minor settled in the region around Quetta Zhob ans Loralai speak dialect, which is a "soft" Pashto dialect very similar to Kandahari Pashto. The Safi, some of the Jaduns, and some other minor northern Gharghashti tribes speak the northern or "hard" Pashto variety. The Jaduns, living on the Mahabun mountain slopes around Swabi speak Pashto, while those living in Hazara speak Pashto and Hindko. :26 Some clans of the Safi tribe speak the Pashayi languages but are mostly bilingual in Pashto. The Karlani speak some of the most distinctive Pashto dialects which are lexically different from standard Pashto varieties, and phonetically very varied. Furthermore, the Karlani dialects have a tendency towards a change in the pronunciation of vowels. Depending on the particular dialect, the standard Pashto [a], [ā], [o], [u] may change into [ā], [â/å/o], [ȯ/ȫ/e], [i], respectively. In the Karlani dialects of Waziristan, Bannu, and Tani (southern Khost), which follow the vowel shift to the greatest extent, these four vowels normally change into [ā], [o], [e], [i], respectively. Much of the Ormur tribe settled in some villages of Waziristan and Logar, who give their name to Ormur the folkloric ancestor of the Karlani, speak the Ormuri language which is distinct from Pashto. :33 However, in general the Ormur are bilingual in Pashto, particularly in the Karlani dialect of Wazirwola. The Sarbani tribes, Southwestern most notably the Durrani, speak (Kandahari Pashto) a "soft" dialect of Pashto; while Northwestern Sarbani tribes such as Gigyani tribe, Yousafzai etc , most notably they speak (Peshawari Pashto) Pashto a "hard" dialect of Pashto. Both of them are considered upper class dialects. In addition, a small section of the Tarin clan of the Sarbani living east of Quetta speak the distinctive Wanetsi (Tareeno) dialect, which is considered by some modern scholars to be distinctive enough to be classified as its own language. The origin of Pashtuns is unclear but historians have come across references to various ancient peoples called Pakthas (Pactyans) between the 2nd and the 1st millennium, who may be their early ancestors. Often characterised as a warrior and martial race, their history is mostly spread among various countries of South and Central Asia, centered on their traditional seat of power in medieval Afghanistan. One theory suggests that the modern Ghilji lineages descended from the medieval Khalaj or Khilji tribe. Some Bettani lineages, however, are said to have descended in part from the medieval Ghorid people.The Bettani are named after their folkloric leader or ancestor, Shaikh Bet Baba (claimed to be among the first Pashto-language poets), who lived in the Altamur range, located between the Logar and Zurmat valleys. He is reported to have been buried in Ghazni. In the 15th century, the Bettani are known to have mainly inhabited the Logar, Zurmat, and Ghazni regions. Subsequently, many of their lineages settled to the northeast, spreading up to the Damaan Valley, Mianwali, and parts of the present-day Hazara Division of Khyber Pakhtunkhwa, Pakistan, in the east, and parts of Kunduz Afghanistan in the north. In the 19th century, the traditional way of life of the Bettani combined small-scale irrigated agriculture with seasonal nomadism or seminomadism. They engaged in pastoral migrations, along the mountain slopes in summers, and inversely, towards the Indus plains in winters. From the 13th century, various Khilji dynasties and ruling entities took control in the Bengal and Delhi Sultanates of the Indian subcontinent. In the 15th century, the Lodi tribe founded the Lodi dynasty, the last dynasty to rule the Delhi Sultanate. In the 16th century, the Sur Empire with its capital at Delhi was founded by Sher Shah Suri, a member of the Sur clan of the Bettani confederacy. Between 1709 and 1738, the Hotak clan of the Ghilji tribe ruled the Hotak Empire based first in Kandahar, Afghanistan and later very briefly in Isfahan, Persia. In the 16th century, Taj Khan Karrani of the Karlani tribe founded the Karrani dynasty, the last dynasty to rule the Bengal Sultanate. Several Karlani clans served in the Mughal army. The Bhopal State, in the present-day Madhya Pradesh state of Central India, was founded in 1723 by Dost Mohammad Khan Mirazikhel. He was from the Orakzai clan of the Karlani tribe, and was a mercenary in the Mughal army. After his death in 1728, his descendants, the Nawabs of Bhopal, continued ruling the state until Hamidullah Khan, the last sovereign nawab of the dynasty, officially acceded the state to India in 1949. The origin of the Sarbani might be connected with the Hephthalites (Ebodalo),:242 who had a large nomadic confederation in the 5th–6th centuries CE, as well as with the Scythians, whose languages are also known to be in the Eastern Iranian group along with Pashto. These groups were settled where most of Pashtuns live today. Ahmad Shah Durrani of the Sadozai clan of the Abdali tribe (now known as "Durrani" after him) established the Durrani Empire in 1747 with its capital at Kandahar. Ahmad Shah adopted the title Durr-e Durrānī ("pearl of pearls" or "pearl of the age"), and the name of his tribe Abdali was changed to "Durrani" after him. :242 Ahmad Shah is now regarded as the founder of the modern state of Afghanistan. He controlled areas from Khorasan in the west up to Kashmir and Delhi in the east, and from the Amu Darya in the north up to the Arabian Sea in the south. It was the second-greatest Muslim empire in the second half of the 18th century, surpassed in size only by the Ottoman Empire. 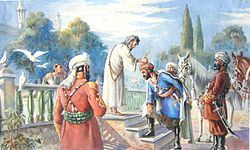 In 1826, Dost Mohammad Khan, of the Barakzai clan of the Durrani tribe, founded the Barakzai dynasty centered at Kabul. The Barakzai dynasty ruled present-day Afghanistan until 1973 when Mohammed Zahir Shah, the last Barakzai king, was overthrown in a bloodless coup by his own cousin Mohammed Daoud Khan. The coup ended the Barakzai kingdom and established the Republic of Afghanistan (1973–1978). The current heir apparent and crown prince of the Barakzai kingdom (23 July 2007 – present) is Ahmad Shah Khan. During the Delhi Sultanate era, the Pashtun Lodi dynasty replaced the Turkic rulers in North India. Some ruled from the Bengal Sultanate. Majority Pashtuns fought the Safavids and Mughals before obtaining an independent state in the early 18th century, which began with a successful revolution by Mirwais Hotak followed by conquests of Ahmad Shah Durrani. The Barakzai dynasty played a vital role during the Great Game from the 19th century to the 20th century as they were caught between the imperialist designs of the British and Russian empires. Pashtuns are the largest dominion ethnic group in Afghanistan and ruled as the dominant ethno-linguistic group for over 300 years. The Sarbani confederacy include the Durrani historically called Abdali including its politically influential Sadozai and Barakzai clans, Shinwari, Barech Alakozai, Achakzai, Niazi (Nayazai), Kasi, Gumoriani, Gigyani, Ghoryakhel, Muhammadzai (Hashtnagar), Yusufzai , Tajkhel and other minor tribes and Khels. The Bettani confederacy include the Bettani Proper (whose highest concentration is in the region around Jandola), the much larger Ghilji or (Ghalzoi), Lodi Lohani (Rohani & Nohani) tribal groups and other minor tribes. The Gharghashti or ( Gharghakhti) tribe of The Kakar, settled mainly in the Balochistan Province of Pakistan and Kandahar, Zabul, Herat provinces of Afghanistan. The Jadun and Panni, settled mainly in Khyber Pakhtunkhwa in Pakistan; and the Safi, whose highest concentration is in the Kohi Safi district of Parwan province and the Pech valley of Kunar province, but are also present in other parts of northeastern Afghanistan and in northwestern Pakistan. There are also other minor Gharghashti tribes. The Karlani confederacy primarily inhabit the eastern, northeastern, and central regions of Loya Paktia, and the southwestern region of Nangarhar in Afghanistan; as well as the southern and central regions of the Federally Administered Tribal Areas and Khyber Pakhtunkhwa in Pakistan. ^ Glatzer, Bernt (2002). "The Pashtun Tribal System" (PDF). New Delhi: Concept Publishers. Retrieved 25 January 2015. ^ Romano, Amy (2003). A Historical Atlas of Afghanistan. The Rosen Publishing Group. p. 28. ISBN 0-8239-3863-8. Retrieved 2010-10-17. ^ Syed Saleem Shahzad (October 20, 2006). "Profiles of Pakistan's Seven Tribal Agencies". Retrieved 22 April 2010. ^ "Ethnologue report for Southern Pashto: Iran (1993)". SIL International. Ethnologue: Languages of the World. Retrieved 18 Feb 2016. ^ a b c d Coyle, Dennis Walter (August 2014). "Placing Wardak among Pashto varieties" (PDF). University of North Dakota:UND. Retrieved 26 December 2014. ^ Wardak, A. (2004). Afghanistan: Essential Field Guides to Humanitarian and Conflict Zones (2nd ed.). Geneva: Crosslines Ltd. ISBN 2-9700176-1-X. ^ Morgenstierne, Georg (15 December 1983). "AFGHANISTAN vi. Paṧto". Encyclopædia Iranica. Retrieved 24 January 2015. ^ a b c Balland, Daniel. Encyclopaedia Iranica. BĒṬANĪ. Originally published on 15 December 1989. ^ Shaharyar M. Khan (2000). The Begums of Bhopal: A History of the Princely State of Bhopal. I.B.Tauris. p. 119. ISBN 978-1-86064-528-0. ^ a b The Hephthalites: Archaeological and Historical Analysis, Aydogdu Kurbanov, Berlin, 2010, page 242. ^ A brief history of Afghanistan, Shaista Wahab, Barry Youngerman, Infobase Publishing, 2007, page 14. ^ "The Durrani dynasty". Louis Dupree, Nancy Hatch Dupree and others. Encyclopædia Britannica Online. 2010. ^ Tarzi, Amin H. "DŌSTMOḤAMMAD KHAN". Encyclopædia Iranica (Online ed.). United States: Columbia University. ^ Romano, Amy (2003). A Historical Atlas of Afghanistan. The Rosen Publishing Group. p. 28. ISBN 0-8239-3863-8. Retrieved 17 October 2010. ^ Louis Dupree, Nancy Hatch Dupree; et al. "Last Afghan empire". Encyclopædia Britannica Online. Retrieved 10 September 2010.